The month of November 1979 began with a couple of very unique matches around the Mid-Atlantic area, billed as a first of their kind in the respective towns. Getting their start in October, two “Eight Man Tag Team Matches” trickled into November. 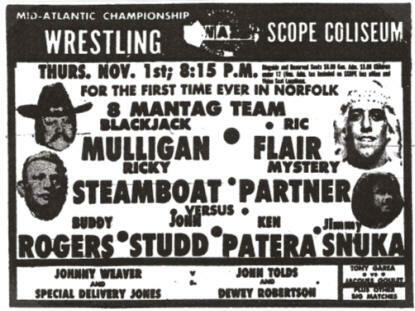 On November 1st at the Scope Coliseum in Norfolk, Virginia the “good guy” foursome of Blackjack Mulligan, Ric Flair, Jay Youngblood and “Mr. Wrestling” Tim Woods went to battle against the equally formidable team of John Studd, Jimmy Snuka, Ken Patera and “the immortal” Buddy Rogers. The bout actually billed Woods’ slot as that of a “Mystery Wrestler,” so imagine the anger when Buddy Rogers and Jimmy Snuka found out they would have to face the man they brutally injured in his first match back in a Mid-Atlantic arena! Also, when this match was signed Ricky Steamboat was supposed to be a part of the fan favorite foursome, but Steamboat was still on the injured list after having been put out of action by Paul Jones and Baron von Raschke, so Ricky’s tag team partner Jay Youngblood subbed for Steamboat. The Norfolk “Eight Man Tag” match was filled with non-stop action, with a fired up Tim Woods leading his team to a dominating performance. The other Eight Man Tag Team Match during the month took place two days later, November 3rd, in Charlotte, North Carolina. John Studd, Jimmy Snuka, Ken Patera and Buddy Rogers again represented the “bad guys,” while the “white hatters” were comprised of Ric Flair, Blackjack Mulligan, Jim Brunzell and Tim Woods. Like Norfolk, Ricky Steamboat was originally scheduled to compete in this bout, but due to him being on the injured list he was again replaced, this time by Woods. The action was once again fast and furious in this unique match, and this time Blackjack Mulligan pinned a dumbfounded Ken Patera to secure the victory for the fan favorite team. The next night in Toronto, Canada saw a distinct Mid-Atlantic flavor at the top of the card. The November 4th super spectacular saw “Superfly” Jimmy Snuka pitted against “Nature Boy” Ric Flair in a United States Heavyweight Championship match, with two referees assigned to keep order. 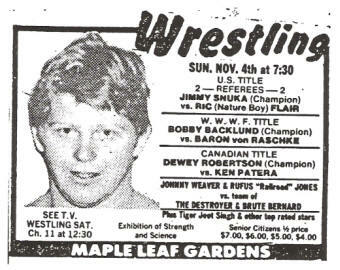 Also on that November 4th Toronto lineup, Dewey Robertson put up his Canadian Heavyweight Championship against the stiff challenge of the World’s Strongest Wrestler, Ken Patera. Two weeks later, Toronto also featured an outstanding card, with Dewey Robertson again defending his Canadian Title belt, this time against the ferocious challenge of United States Heavyweight titleholder Jimmy Snuka. During November, United States Heavyweight Champion Jimmy Snuka was busier in eight man tags, six man tags and conventional tag team matches than in defending his U. S. Title, but the “Superfly” did manage an occasional Title defense. With one notable exception, all of Snuka’s U. S. Title defenses were against the rugged challenge of Ric Flair. In a number of the Snuka versus Flair Title bouts, Ric won the matches via disqualification. Flair’s disqualification wins occurred in Richmond, Virginia on November 2nd, Spartanburg, South Carolina on November 10th and Greenville, South Carolina on November 26th. Jimmy prevailed in one match against Flair during the month, capturing a pinfall victory in Savannah, Georgia on November 11th. Snuka’s lone U.S. Title defense in November that wasn’t against Ric Flair, was against none other than “Mr. Wrestling” Tim Woods! Tim carried his baseball bat, which he nicknamed his “dingbat,” with him at all times for protection against Snuka and his manager Buddy Rogers. The “dingbat” certainly seemed to have a deterrent effect on Snuka and Rogers. The match in Greensboro got out of control early, and the hostilities didn’t abate one iota during the rest of the bout. The double disqualification result didn’t settle anything, which would lead to a number of classic Snuka-Woods U.S. Title wars during the month of December. November saw a major newcomer enter the Mid-Atlantic area, being none other than international star Ray “The Crippler” Stevens. Ray was introduced on Mid-Atlantic television on the November 7th tapings from the WRAL TV studios in Raleigh, North Carolina, and his debut arena match in the territory was on November 12th in the Greenville Memorial Auditorium in Greenville, South Carolina. In that bout, Stevens easily dispatched Tony Garea with his patented “Bomb’s Away” finisher, and the “Crippler” was off and running. In fact, in a mere ten days, Stevens aced a major tile in Jim Crockett Promotions! Upon his arrival in the territory, Stevens targeted “Jumping” Jim Brunzell and Jim’s Mid-Atlantic Heavyweight Championship. Brunzell had a strong beginning of the month, defending his Mid-Atlantic belt successfully against Baron von Raschke in Richmond on November 2nd, in Winston-Salem, North Carolina on November 8th and in Greenville, South Carolina on November 19th. Jim also bested Johnny Weaver on November 6th in Raleigh and Dewey Robertson in Asheville, North Carolina on November 11th with the Mid-Atlantic belt on the line. Then on Thanksgiving night, November 22nd, in Greensboro, North Carolina, Brunzell put up his prized Title against Ray “I Like To Hurt People” Stevens. These two were no strangers, as they had battled quite often in the American Wrestling Association (AWA) prior to them both arriving the Mid-Atlantic area. Stevens used that experience and familiarity to pull off a controversial victory in 27 minutes, ending Brunzell’s Mid-Atlantic Title reign a little over two months after it began. The “Crippler” successfully defended his newly captured Mid-Atlantic Title against Brunzell in Columbia, South Carolina on November 23rd and in Sylva, North Carolina on November 29th rounding out the remainder of the month of November. The Mid-Atlantic television program that was taped on November 14th highlighted just how ferocious the feud between Blackjack Mulligan and Big John Studd had become. As background, on the Mid-Atlantic TV show that aired in most markets on Saturday November 3rd, Blackjack had appeared nicely dressed with airplane tickets to Los Angeles in hand for he and his girlfriend Sara Jo Puckett. However, Studd got into it with “Mully” and some of Blackjack’s nice clothing was damaged in the melee! On the following TV taping, which occurred in the WRAL studios on November 7th, Studd told the viewing audience that he would put up the $10,000 bounty money he previously collected on Blackjack, just to get Mulligan into the ring! Well, Mulligan wasn’t going to have a repeat of getting attacked by Studd on TV, so he came dressed to fight on the November 14th TV taping, replete with his “Texas Street Fight” gear, including spurs! Blackjack called out Studd to fight, but John and his manager Buddy Rogers said they were “professionals,” and only did their business via signed contracts. Mulligan countered that both Studd and Rogers were gutless, but things seemed to end there without getting physical. But the television hour was still very young! When Blackjack was wrestling David Patterson later in the November 14th show, Studd interjected himself into the fray, prompting Mulligan to comment that Studd and Rogers would not leave him alone. Studd seemed to be particular giddy that he had torn up Blackjack’s hatband earlier! Not to be outdone, Mulligan interfered in the last match of the TV program, where Studd and Jimmy Snuka were wrestling Special Delivery Jones and Bob Marcus, causing the latter two men to be disqualified. Blackjack brutally whipped Studd with his belt, causing an enraged Studd to reiterate to the viewing audience that he would put up the $10,000 bounty money he had previously collected on Blackjack just to get Mulligan into the ring, and if Blackjack could put him out of wrestling Mulligan would collect the loot! Mulligan and Studd had a number of heated battles in the area’s arenas during the month, with a multitude of different stipulations. After “Big John” defeated Mulligan in a No Disqualification match in the Roanoke Civic Center on November 4th, Blackjack generally got the better of these bruising encounters during the remainder of November, including a rematch in Roanoke on November 18th, when “Mully” bested John in a Texas Death match, where the $10,000 bounty money was also on the line. 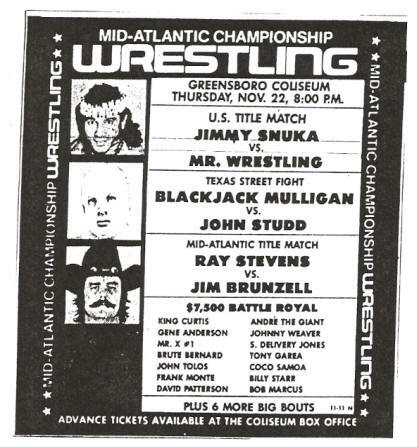 But the two wildest arena matches between Mulligan and Studd occurred on back to back nights, beginning at the Greensboro Coliseum on Thanksgiving night, November 22nd. Before a huge crowd of 11,387 fans, Blackjack whipped up on the mighty Studd, beating him in a brutal Texas Street Fight match! There was no rest for the weary, as the very next night in the boisterous Richmond Coliseum, these two hooked up again in a Texas Street Fight, with Studd’s $10,000 bounty money also on the line. While Blackjack thrilled the thousands in attendance in Richmond with another rugged but decisive win, Studd did manage to limp out of the Coliseum on his own, so at least John held onto his money. Ricky Steamboat’s injury when he and partner Jay Youngblood aced the NWA World Tag Team Titles on October 24, 1979 prevented any Title defenses by the new Champions for much of the month of November. In fact, Steamboat’s lingering leg injury almost resulted in a forfeit of the Titles back to Paul Jones and Baron von Raschke, as Ricky and Jay just barely were able to meet their contractually obligated rematch with the former champs within 30 days. On the Mid-Atlantic Championship Wrestling television program that was taped on November 21st, Ricky Steamboat appeared on TV for the first time since his serious knee injury, and told the fans that while he was not 100% he would nevertheless be capable of defending the World Tag Team Titles before the expiration of the mandatory 30 day return clause. To prove to the viewing audience that he was serious about his position as one-half of the World Tag Team Champions, Ricky promised to wrestle on TV the following week. 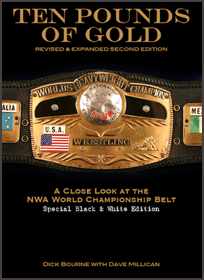 But more significantly, when color commentator David Crockett told Steamboat, who was also the NWA Television Champion, that he was forbidden by NWA rules from holding two major titles simultaneously, Ricky reluctantly relinquished the TV Title. Steamboat reminisced about the Television Title being the first championship belt he ever owned, and called it like his “first true love.” Announcer Bob Caudle commented with Ricky holding onto the World Tag Team Titles, and giving up the NWA TV belt, that those actions should have sent a clear message to Paul Jones and Baron von Raschke that Steamboat was steadfast in his determination to defend the World Tag Titles. On the final day prior to the 30 day mandatory return clause deadline, Ricky and Jay finally defended their World Tag Team Championships against Paul Jones and Baron von Raschke. The long awaited return match transpired on Thanksgiving night, November 22nd, in the Scope Coliseum in Norfolk, Virginia. The battle between these four at the Scope certainly exposed the ring rust of the Steamboat and Youngblood team, but at the same time highlighted the absolute hatred the “good guys” had for Jones and Raschke. This heated battle resulted in Ricky and Jay being disqualified for being absolutely out of control, giving Jones and Raschke the win but not the Titles. The next night in Columbia, South Carolina these four hooked up again, with the same result after a wild melee of a match! As the month of November came to a conclusion, Ricky and Jay were able to get their emotions under control, and started to again show the continuity as a team that brought them the World belts to begin with. On November 24th in Savannah, Georgia Ricky and Jay soundly whipped Jones and Raschke, and followed that with two more decisive victories over the ex-champs before the end of the month, in Charlotte, North Carolina on November 25th and in Christiansburg, Virginia on November 27th. 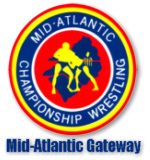 The last Mid-Atlantic Championship Wrestling television show during November, taped on November 28th, had numerous newsworthy moments. Ray Stevens was announced as the new Mid-Atlantic Heavyweight Champion, and he promised to hurt the former champ Jim Brunzell if Jim came back after the belt. Also, World Tag Team titlists’ Ricky Steamboat and Jay Youngblood had their first match back on TV after Steamboat’s injury, easily conquering the duo of the wacky Brute Bernard and his partner Tony Russo. But the most significant happening on the November 28th TV taping, saw Ric Flair run in on a bout between Jimmy Snuka and Rick “Quick Draw” McGraw. Of course, Snuka’s manager Buddy Rogers was at ringside, and it became clear very quickly that it was Rogers that Flair was after. Even Jimmy Snuka couldn’t contain Flair’s assault against Rogers! Ric used Rogers’ walking stick against him, and then used a piledriver hold to drop Buddy squarely on his head. At that juncture, Flair pounded fist after fist into Rogers’ already injured right ear, and it appeared that Buddy could have been seriously injured from Ric’s onslaught. When Rogers was attempted to be interviewed soon after by Bob Caudle, he was in such rough shape that the usually chatty Rogers couldn’t utter a single word. The month of November would end with Buddy Rogers’ wrestling future very much up in the air. 1. Ray Stevens---“The Crippler” entered the area early in the month, and made an immediate impact, acing the Mid-Atlantic Heavyweight Championship from Jim Brunzell. Whether Ray would fulfill his promise to put Brunzell out of wrestling, remained to be seen. 2. Blackjack Mulligan---In one of the most intense and physical feuds in Mid-Atlantic Championship Wrestling history, Mulligan appeared to be gaining the upper hand against Big John Studd as the month of November wore on. However, each of the matches between these two was an all out war!! 3. “Mr. 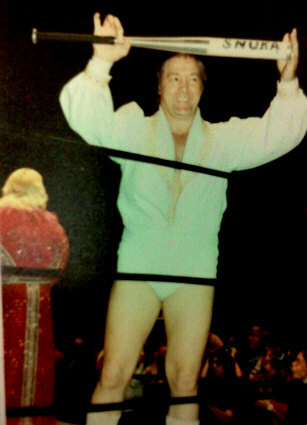 Wrestling” Tim Woods---The unmasked Woods, along with his trusty baseball bat “dingbat” hit his stride in November after being on the shelf in October at the hands of Jimmy Snuka. December was shaping up to be a climactic month for Woods and Snuka. 1. Ken Patera---After dropping match after match early in November, Ken exited the area all together before month’s end. Patera would never compete in Mid-Atlantic Championship Wrestling again. 2. Buddy Rogers---Buddy competed in the ring quite a bit in November, with mixed results. However, when Ric Flair attacked Rogers on the November 28th Mid-Atlantic Championship Wrestling TV show, Buddy’s wrestling future appeared very much in doubt. 3. Jim Brunzell---Jim ran into an old enemy during the month, Ray Stevens, who came into the area with the intent to do Brunzell damage. “The Crippler” made his mark quickly, stripping Brunzell of his prestigious Mid-Atlantic Heavyweight Championship in short order.